The mostly lowrise sprawl behind my apartment tower is without question a world apart from all the modern trappings we enjoy inside our easy living bubble. Some post workday wanderlust drove me out of the compound, and an hour wandering aimlessly around these back alleys proved to be ultimately fruitful. 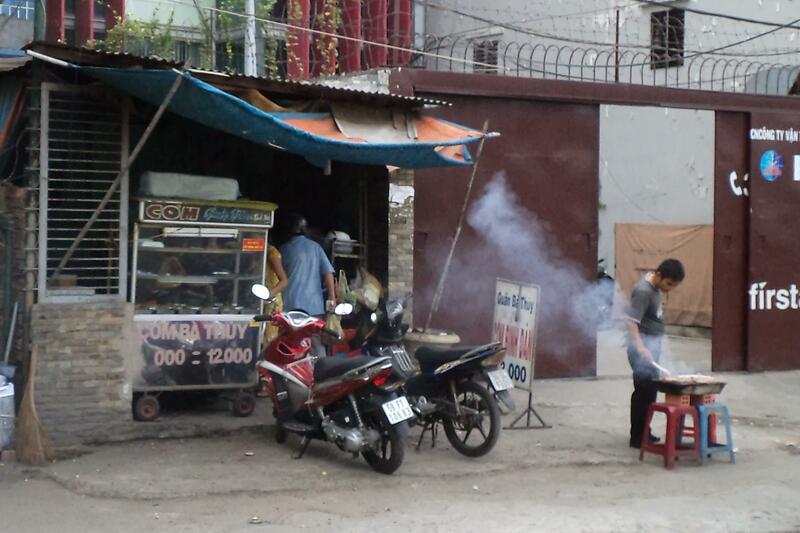 Smoke from a grill set up in a narrow street crossed my path about the same time my appetite began to rumble, and I moved in for a closer look. 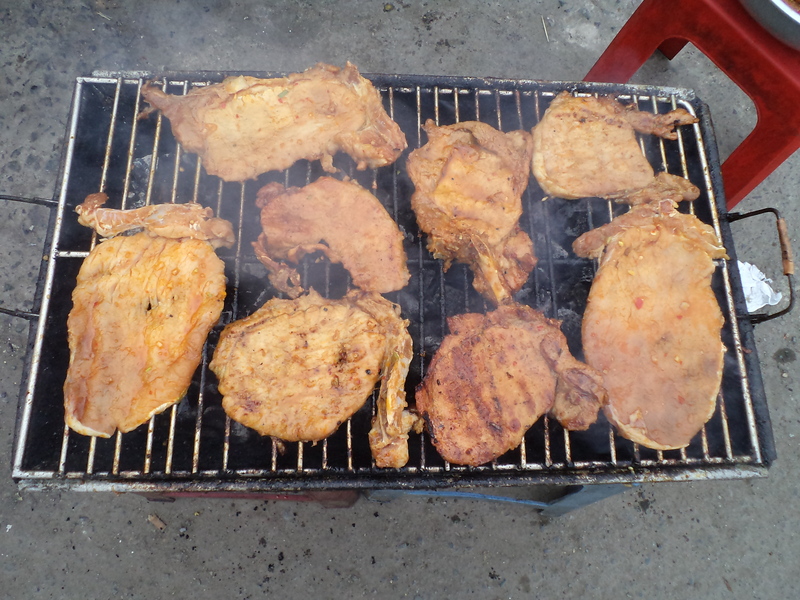 Large pieces of orange hued pork aromatically sizzled away over the hot coals, and whether or not to try one became my only worry in the entire world. I actually walked away but only got about 100 feet before turning around with my final decision…Yes…I want a pork chop. I know the guy working the grill was wondering why the hell is this tall white dude circling the block and now standing three feet away from the grill just staring. The restaurant itself exhuded a bit more of an authentic curb appeal than even I am normally accustomed, and I stood there before the grill wondering if the porcelain god would send a summons six hours later. But man oh man that smoke smelled so good, the meat looked fresh, and I bit, literally. Hunger can be such a powerful motivator, and the guy working the grill smiled and motioned me towards the tables. Smoke from the grill blew into the seating area and I began to feel sorry for anyone sitting in a fast food joint back home. Moments like this I feel a pinch is needed to make me believe I am really here in Vietnam tasting all this interesting food in places the tourists downtown are missing. Remember the nước mắm pha from Phu Quoc? This same dipping sauce makes an appearance here as well and spooning it over the already juicy pork chop and rice added the necessary heat to the sweet and savory meat. The pork’s char added some smoky taste and seemed a natural complement to the dipping sauce. Notice a theme developing here? Sugar and fish sauce seem to be the core building blocks for a good number of dishes. Once the novice home cook masters the basics, layering different flavors seems to be easy enough. Simply add lime juice, pepper, garlic, and chopped lemongrass to the sugar and nước mắm and the flavors of thịt heo nướng are born. Simple enough? Absolutely! Any of us can recreate this rich marinade at home. Cơm Bà Thúy (Ms. Thuy’s Rice) seems to be the name of this thịt heo nướng stand based on the hand painted lettering on the metal cart containing other main dish choices besides the grilled pork. Whatever its name I will be back, and places like this are the reason I veer off the beaten path in search of all things local. Ms. Thuy (if that really was her serving up the portions) certainly does run a place a world apart from the corporate trappings of the Carl’s Jr at Vincom Center. 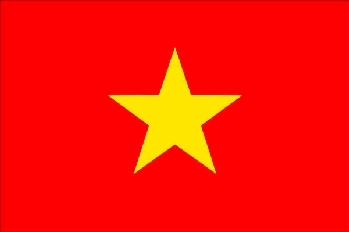 Thịt heo nướng. Vietnamese comfort food at its best. Hi John. This is Tu. I am so proud of you when i go through this web site. You are excellent at writing especially about Vietnamese food. We have all these wonderful things for daily routine but we never ever notify how good we are in this place until someone tell us. Thanks so much for posting all these blogs, i will follow it. By the way, the name of this in Vietnamese should be: sườn heo nướng (grill pork chop or grill pork rib because there is always a bone attached at the edge of the piece). Sườn heo nướng is the best to go with broken rice and “nước mắm chua ngọt” (sweet sour fish sauce), it is very popular for breakfast or supper and only available in the south of Viet Nam. It’s very rare to see that in Ha Noi or anywhere in the North. Once again, thanks so much for all these things. Keep them up until 365. Ms Tu, thank you the clarification of Sườn heo nướng. I promise I will keep going until 365. I am enjoying each meal.